Worth the wait, the new RH New York is a 90,000-square foot, seven level mega-gallery for interior furniture and décor. Located in the historic Meatpacking District neighborhood in downtown Manhattan, it is in close proximity to the new Whitney Museum and the High Line. The building holds 70,000 square feet of interior goodness -- encompassing RH furnishings, RH Modern, outdoor, teen and baby and child, and home décor as well as art. The furniture is presented as different livable spaces. An impressive multi-story entry vestibule with a large glass elevator moves you around the multiple levels of gallery space. There is also double stairwell with an impressive visual cascade of lights by Alison Berger Glassworks. The gallery is an excellent example of customer experience driven design. It is a visually stunning open space with furniture mixed in with gorgeous large format chandeliers and a multitude of water elements throughout. If you are thirsty you can stop by the wine terrace/barista bar with floor to ceiling views of the neighborhood. The water elements (combined with walking around with a glass of wine) relax and allow you to focus on the beauty of the furnishings on offer. I also noted many large natural rock crystals on cocktail/coffee tables. Excellent for grounding the space. Congratulations to everyone at R & Company! Exciting news –to celebrate 20 years in business –R & Company is opening a second gallery location just one block away from the first location in the Tribeca Historic District. R & Company is renowned in showcasing the most innovative and finely made works of historic and contemporary international designers from the 20th& 21stcenturies. 24 artists are represented in the current exhibition covering both locations; at 82 Franklin Street and the new 64 White Street. The new multi-level space is a significant 8,000 square feet with a bright 40 foot atrium that draws in natural light. The atrium is anchored by a stunning extra large scale Jeff Zimmerman custom vine light fixture and will allow for large scale staging of exhibition works. 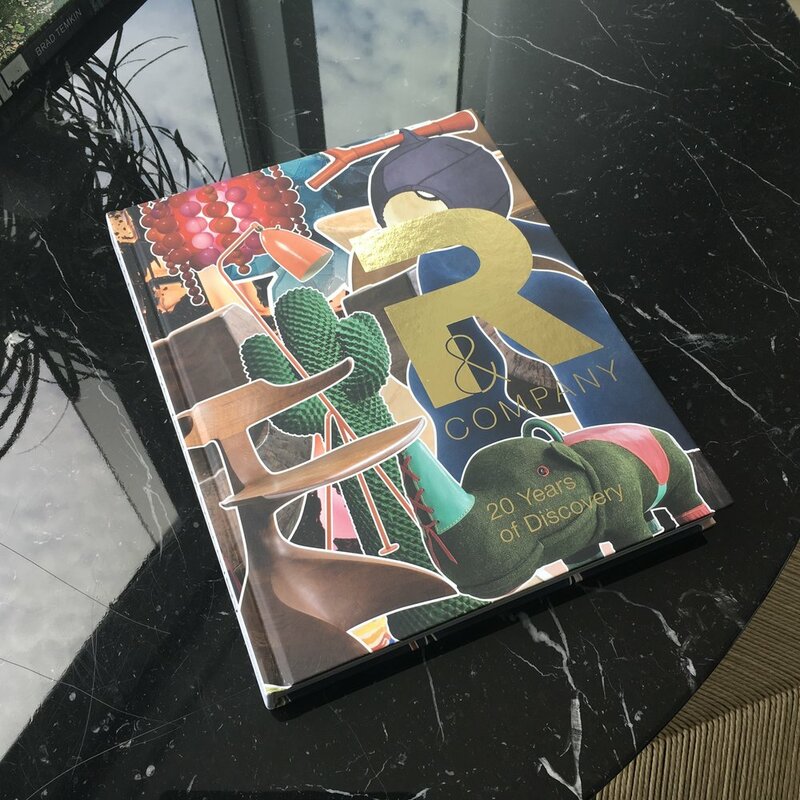 In addition to the new opening, R & Company has launched a new already iconic design book titled “20 Years of Discovery,” celebrating 20 years in business covering the artists they have represented over the years. A great addition to anyone’s design library. Some of my favorite artists include Jeff Zimmerman, Dana Barnes, The Haas Brothers, Pierre Yovanovichand exciting Brazilian designers. Originally founded in 1997 as R 20th Century by Zesty Meyers and Evan Snyderman, the gallery is defined by their combined goals of promoting a closer study, appreciation, and preservation of 20th and 21st century collectible design. They have garnered international admiration for their groundbreaking exhibitions as well as design publications. When in Manhattan, these two galleries are a must-visit. Congratulations to everyone at R &Company! 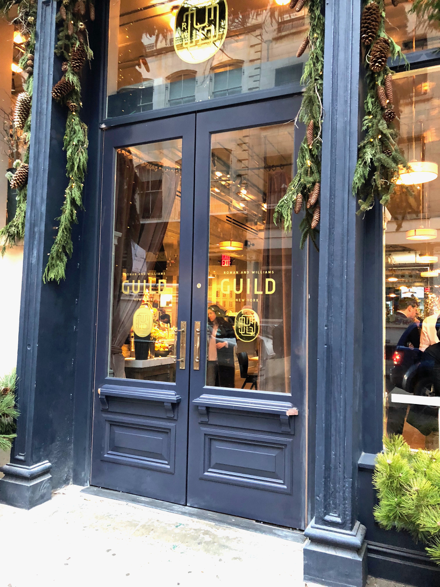 When the interior design firm known as Roman + Williams (aka the dynamic partnership of Stephen Alesch and Robin Standefer) open a home shop combined with a café, flower shop and bookstore – you know it will be outstanding. Famous for their exquisite and timeless design, their new creation, RW Guild, is at once sophisticated, glamorous, comfortable and tres chic. 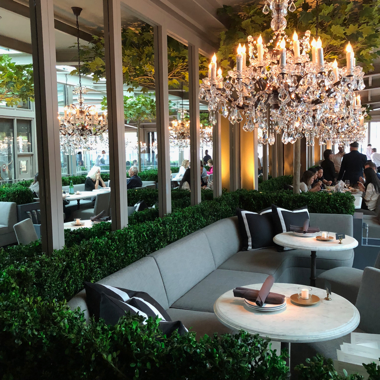 They are renowned for their design work such as Le Coucou, The Breslin and The Dutch restaurants as well as hotels including The Ace, Standard and Viceroy. In additional to residential developments they are also at work on a new project updating the British Galleries at the Metropolitan Museum of Design. The shop is located on the edge of Soho with the entrance on 53 Howard Street. Here they have introduced a new artisan 50 piece furniture collection along with a carefully curated collection of art and accessories from around the globe (with slant toward Japan). The Mercerie Café is a must visit and there is a small outpost of Emily Thompson Flowers. The Café currently serves coffee, cocktails and pastries. Soon it will transition to providing breakfast, lunch and dinner options. At the Café, the beautiful table settings are a mix of Nordic and Japanese tableware that are conveniently available for purchase. Also coming soon in early 2018 will be a bookshop, art room and a private dining room on the lower level. Personally, I gravitated toward a beyond stunning hand crafted wood bed masterpiece -- with Sferra linens, fur pillows and throw -- it was the perfect spot to hibernate until spring arrives. 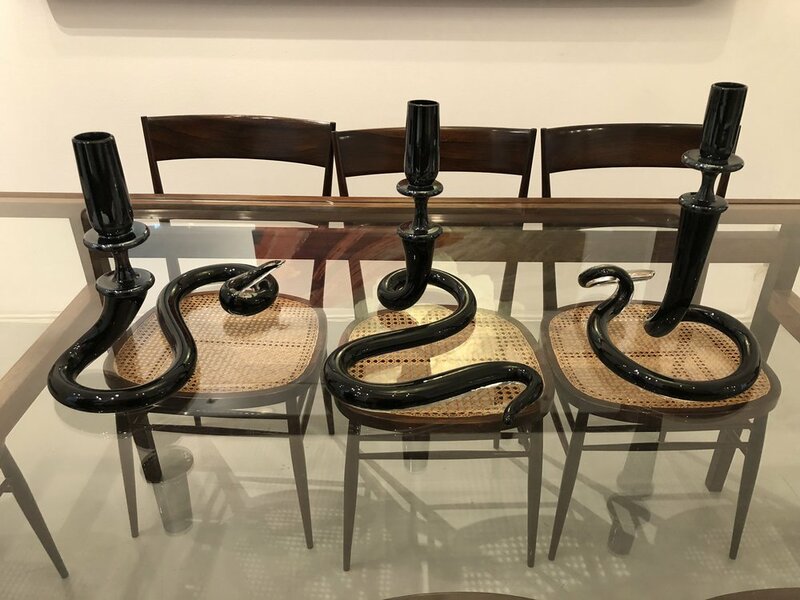 Since it would be an impossible fit in my bedroom, I will have to hope that I can incorporate this stunning piece into a future client’s bedroom. I was thrilled to see a fabulous display of Danish ceramic tableware by KH Wurtz on offer. I have been a huge fan of the renowned Danish father and son team of studio ceramics for their unique and exceptional serve ware which they produced for the restaurant Noma in Copenhagen. Their work has been on my “must acquire someday” list for a long time. I was lucky that I successfully persuaded my husband that starting a tea set would make a most excellent Christmas gift. This is a must visit place while in nyc. If you can’t make it in person visit www.rwguild.com to explore the vibe and shop the inventory. Sunday was an absolutely perfect weather day, the rare type where it seems like everyone is outside. So imagine my surprise that the 2017 ICFF (International Contemporary Furniture Fair), held annually at the Jacob K. Javits Convention Center had a busy and high energy opening with inspired design professionals taking in all the products on display by 700 exhibitors from 30 countries. Around 35,000 design professionals attend this dynamic show. There was a significant amount of innovation, creativity and inspiration around every corner! Unique lighting is always a favorite element of mine. I had a lovely chat with the fine gentlemen at Tala, as their British lighting brand was enjoying an exceptional showing on this side of the pond. The lighting is both high design and energy friendly. They even give back by planting 10 trees for every 200 units they sell. Stickbulb is always one of my favorites and displayed highly sophisticated architecturally inspired lighting. They are ingrained in NYC and are even incorporating reclaimed wood from rooftop water towers. Love it! Bower Studio’s C Light Collection and Arch Floor Mirror were elegant and also very interesting. Brazil had a strong showing with unique wood pieces – in particular I enjoyed Tora Brasil’s exhibit. I spent a lot of time closely admiring the oxidized maple dining table and credenza’s at Tod Von Mertens. Just stunning. The woodworking from Chef to Table also stopped me in my tracks. I need to schedule a local NJ showroom visit to dive deeper into these one of a kind creations. I also fell for a beautiful dining table and bench set from James De Wulf - an LA-based design studio, they offer both amazing unique furniture as well as fantastic ping pong tables. 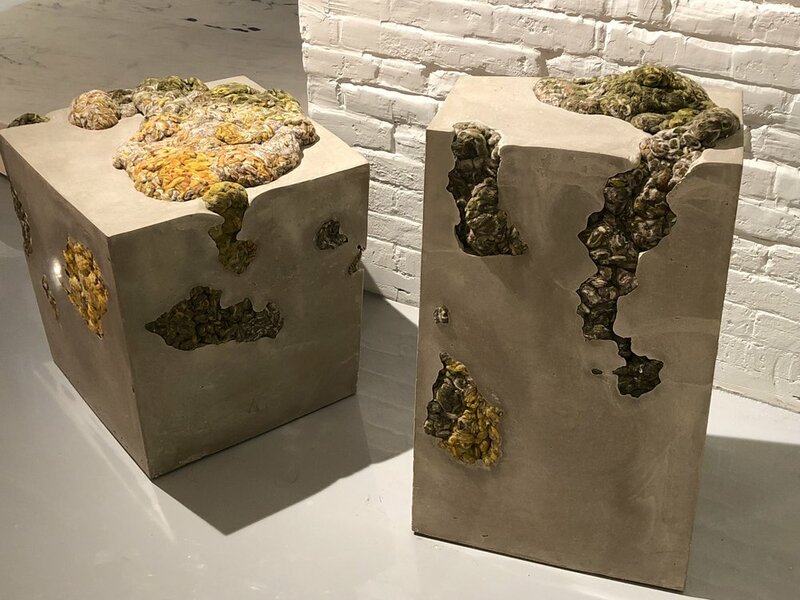 Additional favorite exhibitors were Souda, their new accent tables created with stacking wood and marble pieces were lovely. Matter, Trnk NYC, Workstead and Warp & Weft (gorgeous carpets) are fantastic local favorites with a wonderful selection of must-see outstanding pieces. A special thank you to my wonderful husband, Josh Sutton, for helping me out as my photography assistant at the show helping me capture the energy of this year’s ICFF to share. I always look forward to the Collective Design Show in May in Manhattan. The creativity of this show is always extremely inspiring and it is a highly manageable show to take in, not too big, not too small – it’s just right. The show brings together an array of international galleries representing a best of 20th and 21st - century collectible design. The other great part of this show is there is a nice range of pricing, not everything is extremely high end. Galleries are on display from New York, London, Paris, Los Angles, Miami, Tokyo, Madrid and more. Aside from wandering the awe inspiring galleries, there are creative exhibitions (this year from Noguchi/Stadler and Rockwell Group), designer led tours that can be booked with various designers and presentations in the VIP Lounge. There is also a fantastic book store by Bookmarc to stock up on favorite design books. I had the wonderful pleasure of meeting the American ceramist/artist Peter Lane and learning about some of the inspiration behind his latest sculptures. The entire background of his booth was surrounded by his ceramic sculpture panels made from bronze glazed stoneware and gold leaf. My favorite lighting is designed by the incomparable visionary, Ingo Maurer. Ingo Maurer was born in 1932 in Reichenau Island, Lake of Constance, Germany. He is a renowned German industrial designer who specializes in the design of lamps and light installations. Ingo Maurer began designing extraordinary lamps, lighting systems and intriguing objects beginning in the mid-1960s, after spending time working in New York and San Francisco as a freelance graphic designer. He returned to Germany in 1963 when he founded his lighting company; which since has steadily grown to include a talented production team of sixty people which distribute work globally. There is a strong focus on realizing ideas without compromises. One of his first designs, "Bulb" in 1969 has been included in the permanent collection at the Museum of Modern Art in New York. In addition to the sale of lighting products, special commissioned projects are an important part of business as well as artistic expression. In Munich, he created light installation at Westfriedhof subway station and the renovation and lighting concept for Muenchner Freiheit subway station. For fashion designer Issey Miyake he created an installation for a fashion show in Paris and created lighting objects and installations for the interior of the Atomium in Brussels. Exhibitions include: "Lumieres je pense a vous" at Centre Georges Pompidou in Paris, the Villa Medici in Rome, and the Institut Francais d'Architecture in Paris as well as The Cartier Foundation for Contemporary Art near Paris "Ingo Maurer: Light Chance Reflection". Additional exhibitions include: the Stedeliijk Museum in Amsterdam, the Vita Design Museum in Europe and Japan and the Cooper-Hewitt Museum in New York. There are only two showrooms - the headquarters just outside of Munich and we are very fortunate to have the second in the Soho neighborhood of New York.